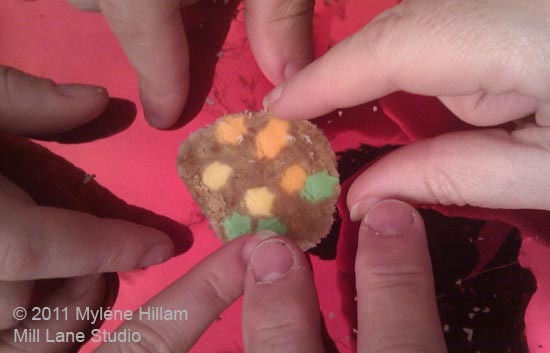 Mill Lane Studio: Who got the Last Piece of Lolly Cake? 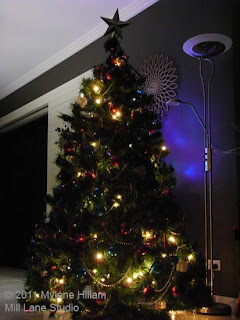 It is one of the most anticipated events on our family's calendar: the evening we all gather to put up our Christmas tree. With Christmas music playing in the background, a mass of boxes around the room and an empty space in the corner, we're all ready to set up the Christmas tree. It's wonderful to have everyone home! For us, putting up the Christmas tree is more than just decorating a tree; it is about enjoying each others company. Of course, it doesn't hurt that there is a food reward at the end. Each year we prepare a variety of yummy Christmas treats especially for this event. 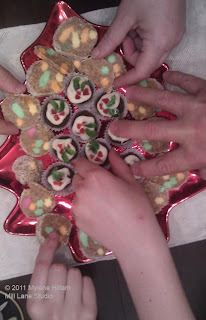 Some of our favourites are Apricot Balls, Mini Christmas Puddings and Lolly Cake. They look so tempting when all laid out on a Christmas platter. With a glass of something festive in our hands we all tuck in and there is much merriment and laughter around the table. Melt the condensed milk and butter together in a saucepan and pour it into the crushed biscuits and cut up lollies. Mix it well. Roll the mixture into a log shape (we get 3 logs from a batch) and then roll it in coconut. Set it in the fridge for a few hours until it is hard and then slice into thin slices. Yum! And who got the last piece? Well, I'm not telling. Let's just make some more! It's something we all look forward to each year Eileen. It's just so wonderful having everyone home for Christmas!